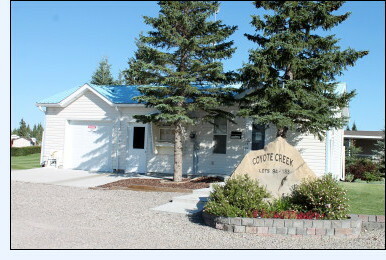 The RV Resort is a fully developed bare land condominium consisting of 180 privately owned RV lots. This common property ties the lot owners together as a community. The concept for the RV Resort and Golf Course Development came about in 1999. After a number of stages by the investors and developer, the ground breaking commenced in the fall of 2001. Completion of Phase I of the RV Resort was completed in the summer of 2002 and the first lot was sold. The construction on the first nine holes of the Coyote Creek Golf Course began in 2003 and finished in 2004. This golf course is adjacent to and surrounds the RV Resort. Phase II of the resort began at the same time. Phase II was completed in 2005, and the golf course opened the following spring. By the fall of 2007 all the lots in Phase I & II were sold and the Condominium Corporation took over full operations of the RV Resort. The Condo Corporation is managed by a volunteer Board of Directors. Up to seven Board members are elected at the Annual General Meeting each September. There are two part-time positions, one Resort Manager, and one maintenance person. The Resort Manager acts as the first contact for owners with questions or problems. This individual also manages lot development approvals, conducts checks for bylaw compliance; and monitors common property. Everyone enjoys working together to help maintain the resort grounds and retain its natural beauty.